A quickie project. 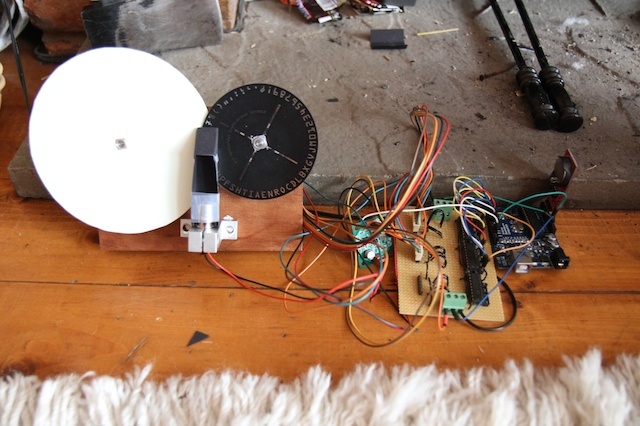 Two stepper motors, a UV laser, some luminous paper, an Arduino, a couple of ULN2803 drivers for the motors, and a “daisy wheel” printed onto transparency film. After playing with some luminous paper and a laser pointer (UV ones work best – red ones don’t work at all), I thought of making a little laser display board thing. I thought about using galvos to draw the characters on, but the mechanics of it would have turned it into a bigger project than I’ve got time for at the moment, so this mini-projector approach will have to do. If you flash the glowing ZnS GITD with infrared laser light then it goes out. I would be chaufed to bits if it is below 230nm. Very cool! Where did you obtain your UV laser from?